Named for the 1983 Rally it took part in… where it emerged triumphant in the experimental cars category. 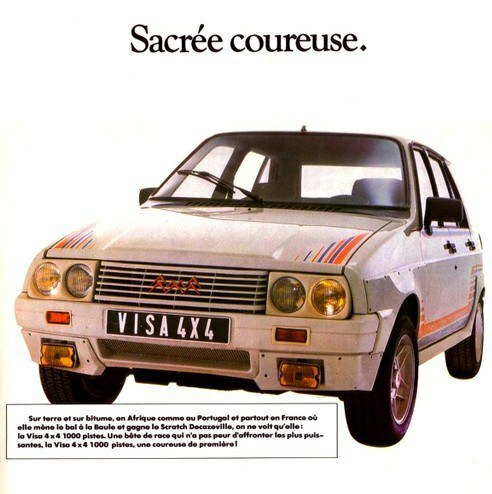 The Citroën Visa "1000 Pistes" then took part in the World Rally Championship. The Visa sportive, only 200 examples produced, became the first French 4x4 marketed for competition. In 1980, a race Visa is developed. What was Citroën's aim? To take part in competitions particularly the World Rally Championship. Several ideas were explored; which became the Visa Lotus, Visa Trophée, and Visa Chrono. But it was the front-engined Visa 4x4, named "1000 pistes", that was victorious at the "Mille Pistes" Rally of July 1983: Philippe Wambergue and Vincent Laverne took the group of experimental cars and lead the prototype to victory. It was decided; Citroën would take part in the championship. The Visa "1000 Pistes" is put into production, limited to 200 models. It was the first French four-wheel drive sold for competition. Its rally success supported the production of the Visa, with the special slogan: "It rocks"!